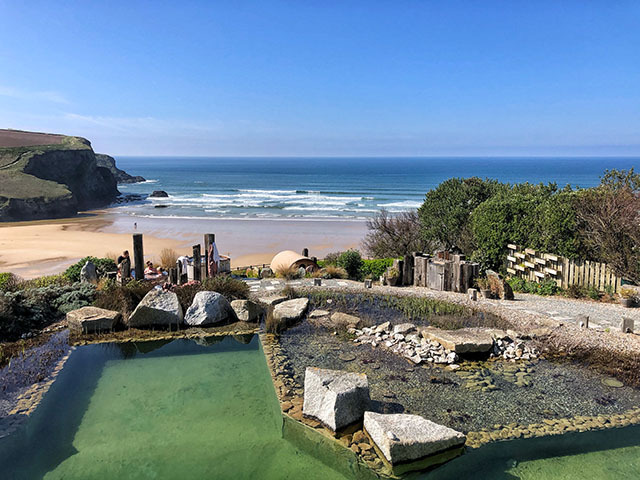 The Scarlet Hotel, in Mawgan Porth was opened in 2009 by the owners of the nearby Bedruthan Hotel. Over the past decade it has become known for its luxurious spa, and the fact that it’s a peaceful place to escape to – strictly adults only. The hotel’s restaurant has prime position, overlooking the outdoor pool and hot tubs, with views out across the beach to the ocean. It is open seven days a week, from breakfast through to dinner, for non-residents as well as hotel guests. Head chef Mike Francis is passionate about using seasonal, local produce, and cooks modern European style dishes. We were invited to try out the lunch menu, and lucked in with the weather on a superbly sunny March day. The restaurant was busy, mainly with spa guests (in their dressing gowns! ), and many diners sitting outside, soaking up the sunshine on the gorgeous terrace. 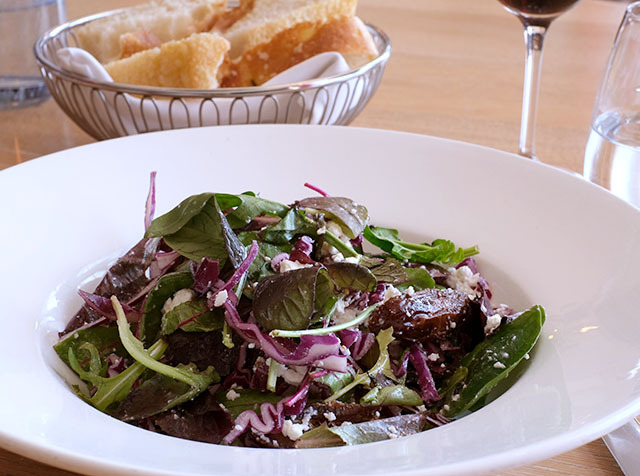 I started with the red cabbage, date and feta salad; it was a large bowl of those three simple ingredients, tossed with a tasty salad dressing, and a lovely, if unusual combination. 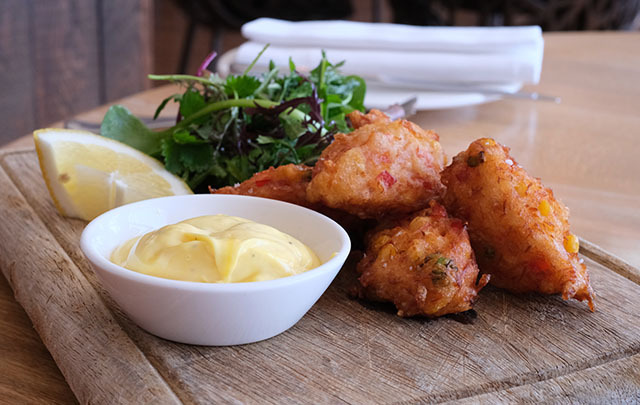 My friend chose the crab and sweetcorn fritters, which were soft and full of flavour, and served with a saffron mayonnaise. Main courses on the menu included mussels with chips and focaccia, a burger with smoked cheddar, bacon jam and onion rings, wild mushroom linguini, and fish and chips. 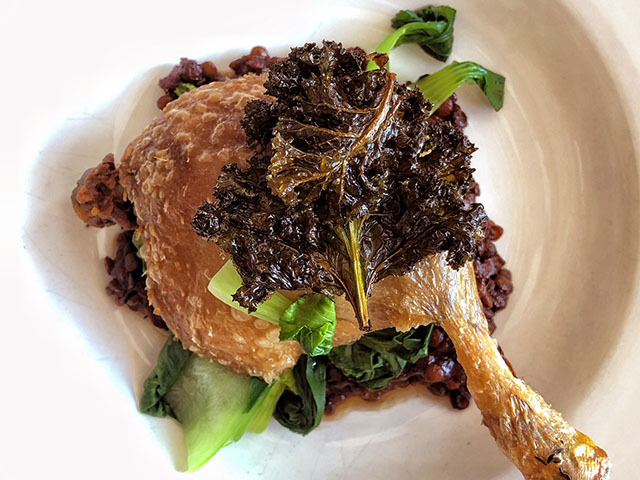 Each day of the week there is a different daily special on offer, and when we visited, the Thursday special was confit duck leg with braised lentils, pak choi, and some deep fried cavolo nero. I can’t resist a confit duck leg so opted for this. The lentils were savoury and tomatoey, and the fresh greens nicely balanced the rich duck meat. 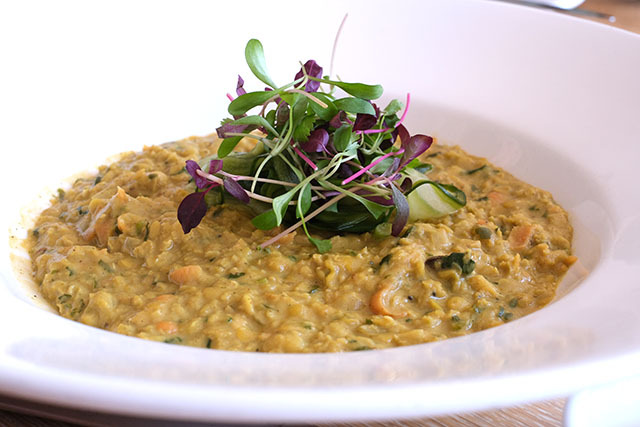 My friend opted for a comforting dish of spiced lentil dal, served with yogurt, pickled cucumber and micro herbs. Each of our main courses was accompanied by a paired wine, as recommended on the menu. 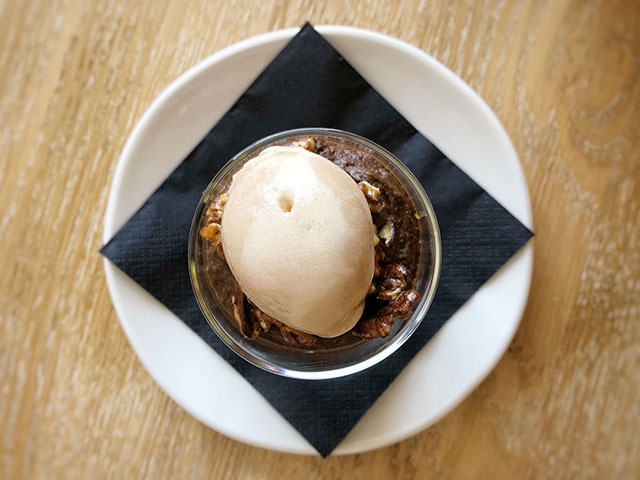 The Scarlet has recently created a five course vegan tasting menu, so I was keen to try some vegan dishes, as the kitchen has obviously been working on its plant-based offerings. I chose the dark chocolate and avocado mousse, served with candied walnuts and banana sorbet. The texture was unusual, a little heavier than a regular chocolate mousse, but surprisingly tasty considering its unusual combination of chocolate and avocado. 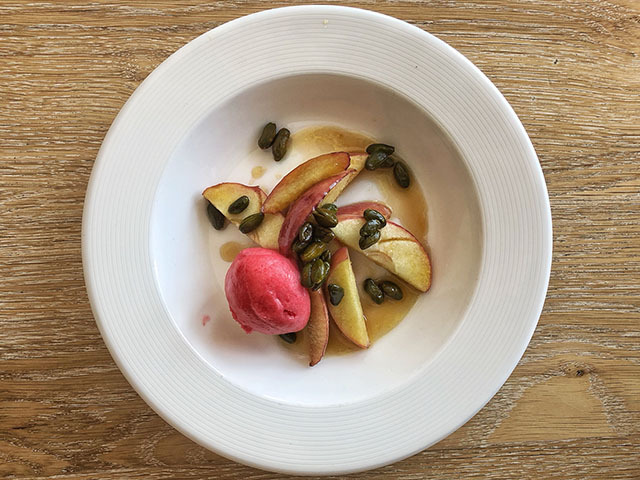 The other vegan dessert on offer was maple roasted apple, with candied pistachios and rhubarb sorbet – a light and refreshing pud to round off a big meal. The Scarlet is currently offering a two night Spring Gourmet Break, with a three course meal on one night, and a five course tasting menu with wine flight on the other, as well as use of the spa facilities. The offer runs until 23 May and prices start at £750 for two people. For more information, menus, and reservations, visit The Scarlet’s website: www.scarlethotel.co.uk. Photography: All photos taken by Barefoot. Disclaimer: We were guests of The Scarlet, and were treated to a three course lunch, glass of wine, and coffee. Thank you to the staff for looking after us very well.